Retinal Tear - Associated Retinal Consultants P.C. Retinal tears are relatively common. In certain circumstances, tears can increase risk of retinal detachment. When we are young, the vitreous gel inside the eye is like jello fresh out of the refrigerator – hard and it fills the whole eye. As we age, the vitreous gel melts and eventually pulls away from the eye wall where the retina is located, just like jello on the kitchen counter. If the vitreous is abnormally sticky, it can pull on the retina and cause a tear. Many patients will experience symptoms such as new flashing lights or new floating spots in their vision, however, some patients do not have any symptoms at all. Risk factors for retinal tears include getting older, near-sightedness (myopia), thinning of the retina (lattice degeneration), trauma, family history, or previous eye surgeries. A small horseshoe tear in the temporal periphery, on the right side of the image. Note the flap, small cuff of subretinal fluid, and small intraretinal hemorrhage at the bottom of the tear. 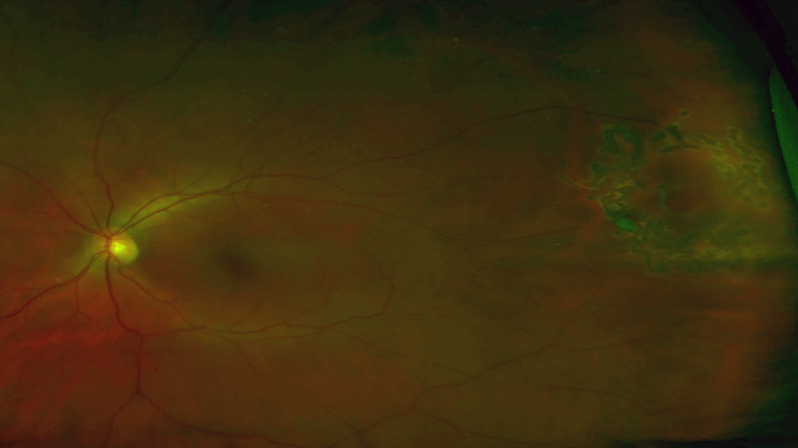 Same retinal tear after prophylactic laser photocoagulation. Note the ring of laser scars placed around the tear. Your doctor will do a complete eye exam including a dilated examination to look for any retinal tears, holes, or predisposing lesions. Often times, scleral depression is performed to help the doctor see as much of the retina as possible. Your doctor will place a gentle pressure on the white part of the eye while examining you if needed. Your doctor may order fundus photography to document the extent or location of the tear. If there is significant cataract or bleeding inside the eye that clouds the view to your retina, your doctor may obtain a B-scan ultrasound to help diagnose the presence of a retinal tear. Laser is often placed around the retinal tear to “spot weld” around the edges to prevent the tear from becoming a retinal detachment. This dramatically reduces the chances of this tear becoming a detachment, but does not eliminate the risk of a new tear from forming. Therefore, patients are often routinely monitored after treatment. Cryotherapy is a freezing procedure to freeze the edges of the tear. 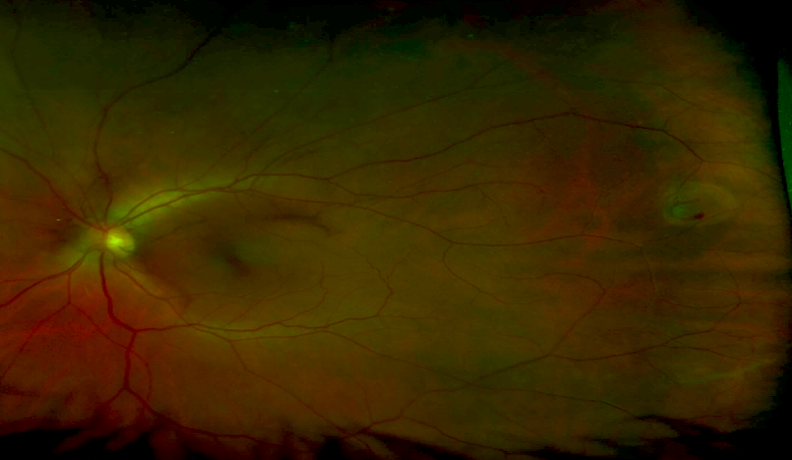 Like laser, this forms a scar around the tear to help prevent retinal detachment. Your doctor will discuss which treatment is favorable for your condition. Retinal tears can lead to detachment and significant vision loss. However, not all tears require treatment. Your doctor will review your condition with you and recommend observation or treatment depending on the examination. Many retinal lesions can be observed with routine monitoring exams, while others require prompt treatment.